vi, 144 leaves : ill. ; 28 cm. Thesis (Ph. D.)--University of Florida, 1984. Includes bibliographical references (leaves 130-142). Lawrence for serving as committee members. technologists who provided the data for this study. ACKNOWLEDGEMENTS . . . . I INTRODUCTION . . . Statement of the Problem . Organization of the Study . II REVIEW OF RELATED LITERATURE . .
Organization of the Chapter . SJob Content Variables . . Availability of Alternatives . .
Work Behavior Type . ... .
Educational Psychology .. ... .
Theories of Vocational Development . History of Work Behavior Types . Marcus Paul Placement Profile . indicated work behavior type. A questionnaire provided demographic data. helped in career decision making. Technologists were predominantly Producers and Concentrators. These types occurred more frequently than in the general population. personality types among medical technologists. job satisfaction or specific aspects of it among practicing technologists. technologists compared to others with comparable education. scores. These variables explain 30.4% of the variance in attrition. enabling them to focus on satisfaction inherent in the work itself. disappointment, dissatisfaction, and turnover may follow. jobs are central to the problems of job dissatisfaction and turnover. challenge for business, industry, and education today. from other health care practitioners. indicated they would not be active in medical technology within 5 years. Schools of medical technology are facing declining enrollments. and attrition on the quality and accuracy of laboratory results. psychosocial implications for individuals, organizations, and society. to the Secretary of H.E.W., 1973). becomes dissatisfied with the job, and sometimes leaves the organization. preclude technologist involvement in patient care at this higher level. most dissatisfied workers and move on to more challenging fields. organizations lacked expertise in the area of person/job matching. be supplemented by objective, job-related tests (Silver & Berke, 1981). rational approach to matching people to jobs or students to careers. level (Asher & Sciarrino, 1974). in Florida as measured by the Marcus Paul Placement Profile? by the Job Descriptive Index? subscales of the Job Descriptive Index? or the intention to leave medical technology? in nonhospital laboratories or other fields? measured by the Marcus Paul Placement Profile. facets measured by the Job Descriptive Index. not be generalizable to other populations of technologists. attrition rate and reduce personnel shortages in medical technology. a greater opportunity for success and job satisfaction. The right "fit"
will become frustrated and quit. designed to add to the limited research on work behavior types. problems relate to people/job matching. accurately reflect their attitudes and preferences. technologists to other fields or professions. measure work behavior type (described more fully in Chapter II). derived from responses on the Marcus Paul Placement Profile. job satisfaction (described more fully in Chapter III). The remainder of this study is organized into four chapters. Chapter III describes the design and methodology of the study. findings, implications, and recommendations for additional research. (1979) stated it was one of the most researched topics in psychology. volume of research on this subject. theoretically based on need fulfillment, equity, or work values. an individual's met expectations on the job" (p. 167). job and the latter term refers to group well-being (Gruneberg, 1979). opportunity for unstructured replies and questions are open-ended. mental health, usually in nonwork settings (Davis, 1977). critical incident technique to collect data on job satisfaction. has also been criticized (Gardner, 1977). brought principles of scientific management to the work setting. satisfaction. Job satisfaction, in turn, led to higher productivity. his data. He concluded job satisfaction consisted of many factors. the teachers expressing high satisfaction. theories of satisfaction as either content or process theories. Maslow's (1943) needs hierarchy theory is a major content theory. individual needs. Maslow arranged human needs in an ascending hierarchy. be satisfied before higher-order needs could assume importance. However, once a need was met, it no longer served as a motivator. recognition. Motivators correspond to Maslow's higher-order needs. doesn't necessarily lead to dissatisfaction. valence of expectancy times the valence of the outcome. level of performance also play a significant role in satisfaction. receive compared to the treatment others receive in a similar job. perceived as equal for the worker to be satisfied. as compared to external attributes (Luthans, 1981). perceptions of internally or externally controlled outcomes. than employees who perceive external control. performed that affect job satisfaction. individual had to perceive the task as being important (Nord, 1977). source of job satisfaction (Locke, 1976). satisfaction to job variety, job autonomy, job identity, and feedback. 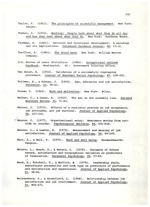 Findings on job variety agreed with those of Walker and Guest (1952). in meeting higher-order needs were satisfied with repetitive work. important for job satisfaction among workers with higher-order needs. with others to achieve common goals. Supervision is another extrinsic factor involved in job satisfaction. related increased productivity to increases in friendly supervision. may have resulted in friendlier supervision (Gruneberg, 1979). saw the group as a vehicle for achieving production targets. studied job satisfaction in terms of role ambiguity and role conflict. them are inconsistent with the behaviors they expect of themselves. They experience role ambiguity when expectations are unknown or unclear. dissatisfaction when role conflict existed. organizational climate correlated to high job satisfaction. individual differences between people affect job satisfaction. or reliable as results from other areas. for growth and promotion usually declined. negative correlation between education level and job satisfaction. or unnecessarily raising the academic qualifications for a job. black and white sailors matched by type of job. factors has not been thoroughly researched (Gruneberg, 1979). and rewards as a result of performance. situations where they compare poorly with other workers. comparable to Steer's results for high achievers and job satisfaction. when they did not receive those rewards. feeling (F), and judging (J) or perception (P). types were more satisfied with work than the NFP types. In summary, job satisfaction is a complex, multifaceted attitude. job satisfaction and turnover will be discussed in the next section. or substitute for turnover when quitting is not a viable option. (1981) called turnover "a voluntary separation from an organization"
Gillies (1982) classified turnover as unavoidable or avoidable. failed to meet the employee's needs or expectations. and productive during training periods (Gillies, 1982). Turnover also has-potentially desirable consequences for organizations. and internal mobility (Mobley, 1982). a new environment, and self-development (Mobley, 1982). by the increased workload created by the loss of an employee. the new replacement may fit in better with coworkers (Mobley, 1982). in family responsibilities are inversely related to withdrawal. organizational and work environment factors related to turnover. important than the actual pay received in the decision to stay or quit. to search for another job were the direct antecedents of turnover. pay in another job, withdrawal intentions, and actual quitting. supervisory behavior as a variable in turnover among hospital nurses. obtained similar results for production and clerical workers. turnover was explained by this factor. discrepant findings in this area of turnover research. impacting on an employee's decision to terminate employment. turnover (Mobley et al., 1979). to higher turnover (Porter & Steers, 1973). 1973) indicate that high job autonomy results in low turnover. Youngberg (1963) drew the same conclusions from their studies. turnover may depend on individual tolerances for job ambiguity. worker will remain with the organization and attend work regularly. In 1973, Porter and Steers reviewed 60 studies on employee turnover. that these outcomes could be attained elsewhere. leavers, at least on a group basis, using job satisfaction measures. to turnover than job satisfaction. occupation rather than on the organization. Wanous (1973), and Federico et al. (1976) supported this position. was a more accurate predictor of actual turnover than job satisfaction. was a more important determinant of turnover than job satisfaction. correlated .21 with the decision to withdraw. however, was a salient precursor of behavioral intentions. to leave. Figure 1 represents this 13-stage model. satisfaction. Job satisfaction, in turn, affected intent to stay. combination of age, job satisfaction, and organizational commitment. (availability of alternatives) influence the withdrawal decision. to explain and predict the turnover process. behavior type will be reviewed in the next section. behavior types, and development of the Marcus Paul Placement Profile. consolidate to form a particular "work style." to jobs (Siegel & Lane, 1982). procedures (Cascio & Awad, 1981). developing new methods to improve selection and placement programs. many organizations into abandoning testing completely (Luthans, 1981). Interviewing has also been a traditional selection procedure. Many consider it an art rather than a science (Luthans, 1981). 1. The same material is not covered in each interview. 2. Different interviewers weigh the same information differently. before the candidate has presented all information. personality questionnaires, projective tests, and background interviews. are evaluated are derived from an analysis of relevant job behaviors. information used for the job). 2. Mental processes (decision making and information processing). 5. Job context in which the work is performed (stresses, hazards). choice, and career counseling than their industrial counterparts. in the labor market. New jobs emerge as others become obsolete. decision, people must make multiple career decisions in a lifetime. abilities) and the constraints of the work world. development and occupational identity formed during early childhood. negative family atmosphere led to a nonperson-oriented occupation. independently of early childhood experiences. Holland (1959) developed a typology theory of career choice. Inventory to estimate personality patterns. feelings of success, favorable job attitudes, and goal resetting. its foundations in trait and type theory. strength of the motor self in respect to the motor stimulus"
remove opposition" (Marston, 1928, p. 140). emotion when competition and aggressiveness are appropriate behaviors. or to be an effective team member. effort to maintain a balance between the extremes of each axis. the point of balance on the axis. person submitting and the person submitted to (Marston, 1928). to induce further submission from another individual" (p. 539). personal charm, friendliness, seduction, or subtle manipulation. Submission and Inducement form the second axis of Marston's model. its subject and inducement is allied with its subject. Marston divides the two axes of the model horizontally. tend to cluster more around one particular dimension. Marston identified clusters of traits for each primary emotion. suggested traits and the emotions. subjects reported themselves in terms of behaviors they least exhibited. list of cluster traits (Figure 4). S0- -4 c- -4 '-4 A. '-. as "active positive movement in an antagonistic environment"
designated to reduce antagonistic factors in an unfavorable environment"
movement in a favorable environment" (p. 2). on the how and why of things and events. job placement, training, and team building. and desire direct answers and actions from associates. the work process (p. 16). and are loyal to the organization, showing great patience. moderation in these situations (p. 17). their decisions and actions with irrefutable documentation. their assignments with precision (p. 17). least represents their work behavior. strengths and tendencies by identifying one of 18 possible types. c A V : aO U e 0. .1 C.. c 0%4 c >, 4 ,4 "
data-oriented position or in one that is people-oriented (Bauch, 1981). are Inducers. Concentrators and Producers make up the remaining 60%. behavior type and specific areas of job satisfaction. of work, unanticipated job tasks,and recognition for accomplishments. and the quality of work influenced good working conditions. of identity for the profession of medical technology. laboratorians by other hospital personnel. higher order needs was strongly associated with job satisfaction. experienced higher levels of self-actualization, esteem, and autonomy. related to availability of modern technology in these facilities. consideration, discussed earlier in the job satisfaction text. Authority distinction is comparable to authoritarian leadership style. to the goals, methods, and activities of their department. and Matteson et al. (1977). rewards, helping relationships, interpersonal relations, and recognition. satisfied with their jobs than bench-level technologists. reported the lowest satisfaction scores on all job facets except pay. satisfaction and were the most dissatisfied group on the pay subscale. All groups were equally dissatisfied with promotion opportunities. and recognition from other health professionals. satisfaction and career commitment of medical technologists. from other health practitioners, poor pay, and job stress. with responsibilities), and rapport with management. creation of career ladders to permit advancement within the profession. encourage them to remain in the profession. programs, writing to national sources, and visiting an employment site. medical technology and how much their knowledge increased over time. that technologists worked weekends and holidays in hospital laboratories. security as a major factor in selection. technology as the leading factor influencing their career choice. 1970s, medical technology programs were popular among undergraduates. for success in medical technology. higher percentage of intuitive types among educators and administrators. disappointed with the actual work situation. of persistence, and a high capacity for patient, thorough effort"
(p. 36). She added they should also like people. independence and recognition were least satisfied with their jobs. This chapter includes the design and methodology of the study. collection, instrumentation, and data analysis procedures. of the technologist and overall job satisfaction? specific aspects of job satisfaction? other fields in overall job satisfaction? working in nonhospital laboratories or other fields? and attrition or the intention to leave medical technology? technologists holding a bachelor's degree were invited to participate. excluded to assure homogeneity of the sample. the past 5 years who lived in the community. nonrespondents or individuals who did not complete all instruments. Table 1. Response rate on questionnaire by group of respondents. each group of technologists and the percentage returned. technologists. The overall response rate was 61%. (Bass & Barrett, 1974; Crites, 1969; Gruneberg, 1979; Vroom, 1964). jobs, they provide information that may be used to infer satisfaction. a variety of educational levels and jobs. score of 27 indicates a balanced attitude toward a job facet. retest reliability of .57 after a 16-month interval. subject's responses and designates the predominant work behavior type. were described in Chapter II. Please check the statement that is most accurate for you. accurate description of my work behavior. accurate description of my work behavior; the first is not. total score for each participant. System (SAS) with appropriate subprograms to answer the research questions. 22.8% indicated they would most likely leave within the next year. Table 2. Characteristics of practicing medical technologists. Table 3. Characteristics of former medical technologists. and 57.9% had practiced as medical technologists more than 5 years. less than 5 years ago. availability of an educational program, job opportunities, and security. advancement and financial rewards, and felt it offered security. the Concentrator type (36.8%). More than one fourth (26.3%) were Inducers. Table 5. Work behavior types of medical technologists. II contains detailed descriptions of the types. dimension had the second highest mean score (x = 1.38). type on each work dimension. responses on each dimension of work behavior. environment as they value the tried and proven methods. Subtypes of the former medical technologists were heterogeneous. shortly after entering the field. subtypes complete the work on time with little supervision. opportunities for contacts with fellow workers or patients. as administrative or teaching technologists. among this group approximate those of the general population. used a one-way analysis of variance (ANOVA) to answer this question. satisfaction score of the subject. JDI scores of the other work behavior types. Source df Sum of squares Mean square F ratio F prob.